Betty was a true ambassador and friend to the City of Olathe for over 57 years, serving in many capacities, including the Olathe Jr. Service League, the Republican Women’s Club, the Olathe Medical Center Board, the YMCA, Olathe Night at the Royals, the Olathe 150th Anniversary Committee, the Olathe Chamber of Commerce Board and was the volunteer weekly coffee coordinator for several decades, volunteering with the Salvation Army, Greater Kansas City Days, served as a board member of the Johnson County Museum, and was active in several GOP Campaigns in Johnson County, KS. 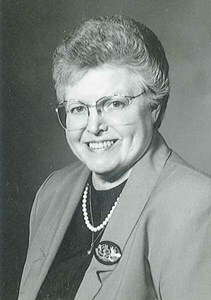 Betty most-deservedly received several awards and recognition in honor of her civic participation, a highlight of which was the Olathe Citizen of the Year in 1987. She was the first President and founding member of the first PTO in Olathe, KS, the first female President of the Olathe Rotary Club, a Past President of the Ambassador Club of Olathe, a founding member of Leadership Olathe, the 100th President of the Old Settlers Committee, as well as serving as the secretary for over three decades, President of the Chrysantes Club, President of the Federated Women’s Club, and was a founding committee member of Heart to Heart International. Betty was a member of Grace United Methodist Church, and the same bridge club for over 50 years. She is survived by a large, loving family including her children Steve (Janet) Hougland, Mike (Nancy) Hougland, Blaine (Connie) Hougland, and Allison Daylong, her grandchildren Ben and Amy Hougland, Phil and Rachel Hougland, Greg and Kourtney Hougland, Adam Hougland, Ross and Emily Hougland, Luke Hougland, Brittany Hougland, Caleb and Andrea Hougland, Brennan and Jennifer Hougland, Carmen Hougland, and Katlyn and Pablo Esteban, and great-grandchildren Emily, Tyler and Matthew Hougland, Jackson and Colton Hougland, Natalie, Ryder, and Rhett Hougland, Clayton Hougland , Hudson and Sawyer Hougland, and Jacob, Alonso, and Valentina Esteban. She is also survived by her brothers Harry (Jere) Turner, and Art Turner. She was preceded in death by her brother Richard Turner, sister Caralee Dibble and husband, Paul, and sister-in-law Bert Turner. In lieu of flowers, memorials are suggested to Heart to Heart International 13250 W. 98th St. Lenexa, KS 66215. Add your memories to the guest book of Betty Hougland. Betty was one of the first handful of people that I met in Olathe back in the late 80's and early 90's. She was a sweetheart and I enjoyed all the conversations that I had with her. I had her on my mind off and on for many months now. I am so sorry for your loss as well as the loss for her community spirit. She was such a lady. My prayers are with you all. I had the privilege of working with Betty while I was the Traffic Supervisor with the Olathe Police Department back in the 1990's to mid 2000's. We actually got to be friends and she would call me often to ask for advice when planning some of her events. She was the sweetest person and always so thankful to the Police Department for all they did. I just noted Betty's obit. What a wonderful person she was. A great friend to all she met. I can remember her helping us make campaign signs one year, meetings at her house, seeing her in the community. A true blessing it was to have known her. The best thing we all can do is to share the things she helped so many people with. We would like to send our thoughts and prayers to you. Remember all of the great times you had with her. She was such a caring, loving person. She led a wonderful life and has left you many memories to be passed on to your family. will always take pride in her accomplishments. Betty was indeed a great lady and civic leader. She was woven into the true fabric of Olathe and touched us all in some very special way. The impact she had on our chamber and community will not be forgotten. With her warm smile and kind heart, Betty was our 'sunshine' and always made everyone feel so welcome and like you were part of her family. We have a very special memory of Betty. When she learned of my son's love of vacuum cleaners when he was around five. She invited him over to her home and presented him with an old working Kirby vacuum around his birthday--truly a prize gift he had always wished for. Decades later he still has that Kirby and will always remember that day she made so special for him. We will cherish our fond memories of Betty always. Steve, we are so grateful for your mom. You and your family are on our hearts and in our prayers. God bless you all. Our deepest condolences to the Hougland family. Much has been said about Betty's service to the community. As with many, she was one of the first people we met when we moved to Olathe in 1984. From there I enjoyed Betty's friendship while working with the Chamber of Commerce especially organizing busses for Olathe Night at the Royals as well as every Wednesday for Rotary. She was the epitome of the selfless public servant. Her list of services to the community is staggering and that is why many of us referred to her as "Mrs. Olathe". I will miss her warm smile and valuable advice. Truly a terrific loss to the community, but her impact will benefit us all for many years to come. She was a beautiful woman and raised a loving family...a very special lady. I have known your dear mother for 79 years. I first saw her in my second grade classroom when her mother, Neva, brought her to my 2nd grade classroom at Randolph School in Topeka, KS. .We not only were classmates but also were neighbors living 1/2 block away from each other! We walked to school each day in Grade School, Boswell Junior High and drove separately to Topeka High School. We graduated in 1951.We also went to KU together for several years. We kept in touch all through the intervening years and were good friends who would call once in a while to "catch up!" She was the main reason I moved to Olathe to attend graduate school at K.U. in 1972. She was a very special lady who loved Olathe and was ALWAYS a strong Ambassador for the city. I remember when Olathe sent 13 FULL busses to the Royal's game. My family was on those busses as well as my mother and three of her friends from Topeka who came to attend that game! I had no idea that Betty was the President of so many organizations! She never bragged about herself! I also know that she was extremely proud of her large family. I always called her the "Matriarch!" You have big shoes to follow.....and I know you will! My sincere condolences to each one of you. Betty will be sorely missed! For everything Betty contributed to the Olathe Community, she was perhaps proudest of how she instilled her love of community in her children. She was a wonderful mother whose golden soul is reflected in her sons and daughter. Steve and Janet, I am thinking of you and the rest of the family as you deal with the loss of a truly "Phenomenal Woman." All of Olathe mourns with you. We love you so! Condolences to the family. Thanks Betty for your always warm and gracious greetings. You will be missed. Joy and peace to you in your new heavenly home. She has a legacy that can't be surpassed in Olathe. My sincere condolences to the Hougland family! God bless you and your family. My sincerest sympathies for the loss of your mother. May you seek comfort in the many great memories you have. Betty was the first person to welcome me to Olathe when I moved here in 1982. She was working for the Welcome Wagon then and made me feel so special that I have never forgotten that encounter in all these years. All of us who met her, however briefly, are blessed. I know her family and friends will miss her terribly. My heart goes out to you. So sorry to hear of Betty's passing. What a lifelong friend she was of my family. Betty's mom, Neva, and my mom, Maxine were longtime bridge playing partners. So our families relationship goes back to Topeka. There are not enough words to describe the kind of person/woman Betty was. Such a community leader and contributor. She adored Olathe. She would always make sure that Joyce had her booth reserved for the Old Settlers Craft Show. She was so organized and on top of whatever she took on. A real classy lady, she will be missed. God Bless all of you! Steve I am so sorry for your family's loss. I ask at this time that God gives you all as a family the strength that you need, and will keep you close to each other. If there is anything at all that I can do you know how to reach me. My prayers continue to be with you and your family. I only met Betty one time. I did not meet a stranger. She was as welcoming as the welcome wagon always should be. Full of chatter and life. She will be missed. We are holding you close in thought and prayer. Like many, Betty was one of the first visitors to our home 27 years ago. I have kept her many notes to support to Steve and the Lady Falcons, as she was always quick to acknowledge a special victory with an article from the Olathe Daily News! Betty was a one of a kind. She had a smile and kind word for everyone. She will be missed, but remembered so very fondly. Much love to the Hougland family. I loved Betty! She was one of the sweetest ladies that I've ever met! Every time I saw her she had a smile on her face! She will truly be missed by so many! May you all find peace and comfort during this difficult time.